You don't have to be stuck with simple porch lights for your beautiful home. Instead of going with the generic choices and being like everybody else, your property should have features that make it uniquely yours. 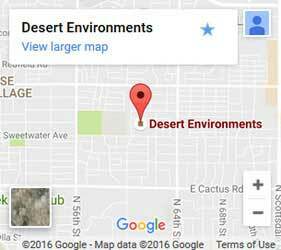 Desert Environments can make that dream come true. We can create and put up custom outdoor lighting in Paradise Valley just the way you want it so you can feel comfortable both inside and outside your house. Where do you want your outdoor lights? We can put them just about anywhere. Have a couple of palm trees in your yard? We'll string up some lights on them. Do you have a cactus in your yard that you don't want people to accidentally bump into at night? We've got you covered. 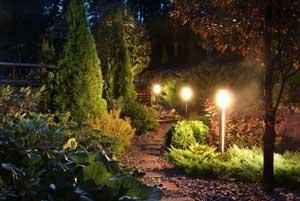 Our landscape lighting can guide people down a path or let them focus on that beautiful lawn you just had cleaned up. We're able to put outdoor light fixtures just about anywhere, from porch and patio lighting to wall lights to putting lights in water features like your fountain or pool. Can outdoors lights be put in water? Of course! While it may seem counter-intuitive, over the years developments have been made to take the shock out of underwater lights. While you can certainly choose to put an outdoor lamp out and shine it into your pool, we are also able to put light fixtures directly into the water by waterproofing the entire lighting system so there's no risk to you or the light. Colored lights can be timed to make a gorgeous light show on a spraying fountain. Add a couple of lights to your pool to cool off on those summer Arizona nights. Showcase your customized water structure and landscaping with lights. According to a recent Home Office Research Study, security lights deter burglars from choosing your home, especially if they're motion-sensitive. We can help you pick and install external lighting in the ideal place to catch any unusual outside activity at your property. 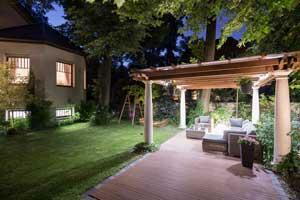 We'll also help you choose the perfect brightness that will light up a large area without waking up your neighbors. With over 25 years of experience in the valley, you don't have to worry about us messing up the job. In the rare instance that something goes wrong, we include a 1-year warranty on our lighting projects just in case. So choose us with confidence and call or fill out our contact form today!